Eeek!!! Only nine days til Christmas!! I haven’t made ANY Christmas cookies yet!! But what is more important? Cookies or BBBabe Bread? Clearly, you and I already know the answer. Ha. It’s not even close to being enough. And I should have known too. I weighed the single lemon’s peel (it was 25 gm) to find out how much sugar to use for the two orange peels – Susan’s recipe is for 10 medium lemons. I ended up with an inordinate amount of syrup and have decided to use it to make the bread. I hope it will work. I really do. But I didn’t dare put the syrup in the fridge. Apparently, I should have used much less sugar and water to make the candied peel…. I was surprised at how little rum was used to soak the fruits. It hardly seems enough to make a difference! Mmmmm, candied peel tastes delicious! Tuesday 13 December 17:01: Oh oh. Tanna just reminded me about the starter. I’ll make it after dinner…. Oh yah, reading. Yes, one of these days I will read (and retain) the recipe in advance. Have any of you tried washing the floor while a kitten is leaping around thinking that it’s a fun new game? Thursday 15 December 18:56: Oh oh. It’s looking as if I’m going to be late late late with my posting. I made the starter at around 23:00 last night. As usual, I decided to cut the recipe and make 2 loaves instead of 3. (No freezer space) I put the starter, butter and soaking fruit into the oven with only the light turned on. This morning, the butter was nicely soft, the fruit beautifully aromatic, and the starter looked exactly the same as it had the night before. Begin freak out. I left the starter in the oven a little longer, hoping it would start to move just a little. Of course, as I mixed, I continued a major freak out about how much yeast (lots!) and how little liquid (hardly any!) was to go into the final dough. And LOTS of butter!!! Wow, that really is a lot of butter. Amazingly (for me, anyway) the dough was beautifully smooth. Did I knead it enough? I hope so. As usual, I kneaded by hand for about 10 minutes – as opposed to the 20 minutes with an electric mixer. With a tiny bit difficulty initially, I managed to knead in the dried fruits – they wanted to splurge out at first – but I pushed them into submission. And then I plopped the smooth, silky, wonderfully fragrant dough into the clean dry bowl. Yes, that’s right; I did NOT butter the bowl. Are they kidding? The dough is oozing in butter as it is! Friday 15 December 09:11: The dough hadn’t really budged at all so I left it overnight in the oven with only the light turned on. It still looked pretty much the same early this morning. So. I decided to treat it like cookie dough and make two giant sized cookies. I shaped it at 7 this morning and it is still languishing on its tray under a plastic hat in the oven with the light turned on and a bowl of hot water. Am I going to use the icing sugar? I don’t know… for some reason, I’m really opposed to making sugary sugary things this month! I do have a little bit of egg left (from using only 2/3 of an egg for the dough) Maybe I’ll do an egg wash instead…. [Y]ou really won’t notice a huge rise during proofing. [T]hey don’t do much in the long rest but they do in the oven. Not super big rise but what does is enough and it’s almost all in the oven. Friday 15 December 15:45: Well, the bread smells great and what a beautiful colour!! But… sigh… the loaves are heavy as lead and flat as pancakes. I foresee plenty of delicious toast in our future. Or perhaps trifle. Cover the peel quarters with cold water. Bring the pot to a boil, then drain and rinse in cold water. Cut each quarter into thin strips (julienned) – Susan suggests about four strips per quarter of a lemon section. Put the strips back into the pot. Cover the strips with cold water and blanch them again. Drain and rinse in cold water. Repeat the blanching and draining one more time. In the largish pot, stir the sugar and measured water together. Bring this to a boil, stirring until the liquid is completely clear. Add the peels by lowering them into the molten sugar water (Susan says if it “splashes on your skin, you will be very sad”. No kidding… :lalala:). Lower the heat and simmer until the peels begin to be translucent: roughly 45 minutes. Drain, reserving the syrup for another use. Put the peel in a single layer on a wire rack to dry overnight. Store both the peels and the syrup in the fridge or freezer. Fruits: In the evening of the day before making the bread, toss the fruits, almonds and rum in a medium-sized bowl. Cover and leave at room temperature (oven with only the light turned on) overnight. Starter: In another medium-sized bowl, stir together the starter ingredients with a wooden spoon until they are well mixed. Cover and leave at room temperature (oven with only the light turned on) overnight. Actual Dough: Put all the ingredients EXCEPT the soaked fruits into a large mixing bowl. Stir with a wooden spoon until the dough comes away from the sides of the bowl. Turn the dough out onto an unfloured board. Wash and dry the mixing bowl. Kneaded the dough for 10 to 15 minutes until it is smooth and elastic. Flatten the dough and put the soaked fruits and almonds on top. Fold it over and gently knead them in to distribute them evenly. Put the kneaded dough into the clean bowl (no need to butter the bowl), cover with a plate and allow to proof for about 30 minutes. (Or as I did, overnight.) Apparently, there is no need to worry that the dough doesn’t rise very much. Turn the dough onto an unfloured board. Divide into two even pieces and shape them into torpedo shapes (batards). Allow them to rest for 10 minutes or so. Put the shaped loaves onto parchment-lined cookie sheet and cover with a clean tea towel followed by a plastic bag. Put the tray into the oven with only the light turned on. Place a bowl of hot water in the oven to keep the air moist. Turn the oven to 375F with the rack on the top-most position. Partially fill a roasting pan with hot water and put it onto the bottom rack. Just before baking, brush the loaves with egg wash. Then bake for 10 minutes on the uppermost shelf to prevent the loaves from burning on the bottoms. After 10 minutes, remove the roasting pan and turn the tray around (to account for uneven oven heat) and bake for a further 20 minutes. Allow to cool on a well ventilated rack – they’re still baking inside. Freak out just a little more when the bread is quite heavy and dense. Decide that it will make delicious toast. 1.) Lemon: The peel of one lemon is roughly 25 gm, which produces about 20gm of candied peel. Not really paying attention (there’s a big surprise) to exactly how much peel I needed, I guessed and only candied the peel of one lemon. 2.) 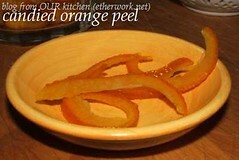 Peel: I ended up with only 20 gm lemon peel so made up the difference with orange peel. Luckily, there was plenty of that. 3.) Slivered almonds: I THOUGHT we had lots of almonds. But no, I was mistaken (another big surprise, eh?) and discovered we had only 10 gm. So I made up the difference with ground almonds. Hmmmm, perhaps this is why my bread turned into a rock…. 5.) Salt: Aaaughhhhhhhhhhh!!! I just remembered that I FORGOT TO ADD THE SALT!!! 6.) Sugar: Because of using syrup instead of water to create the milk, I reduced the amount of sugar. 7.) Butter: Susan calls for unsalted butter. Good thing I used salted…. (see #5) Of course, I was planning on reducing the amount of salt to account for using salted rather than unsalted. Photos. You’re expecting photos, aren’t you? I did take them. But due to a technical hitch (ie: I’m challenged), they’re trapped in the camera. As soon as I can, I’ll post them. This dough was indeed very easy to make and knead. I’m not sure why it wasn’t a stellar success but I suspect that the chilly kitchen and substitutions may have been my downfall. Or was it a downfall?? We haven’t yet tasted the bread (it’s still cooling) but it smells delicious. And it looks quite beautiful too. Really it does! Of course, we’re hoping that you will now bake along with us. 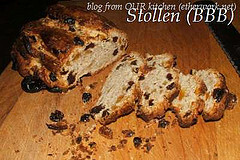 To receive a Baking Buddy Badge to display on your site: bake Stollen in the next couple of weeks and post about it (we love to see how your bread turned out AND hear what you think about it) before the 29 December 2011. Thank you, Susan! I can’t wait to taste this bread! Now excuse me while I go to ring bells and raise a glass in honour of your wedding today. All the best to you both! Natashya, Living In The Kitchen With Puppies: The Bread Baking Babes have been Stollen! edit 17 December 2011: T showed me how ridiculously easy it is (once you know how) to turn the device on and get the photos out of the camera. The photos are in this post here: Biscotti, anyone? This entry was posted in baking, BBBabes, bread - yeasted & unyeasted, bread recipe, equipment and techniques, food & drink, posts with recipes on Friday, 16 December 2011 by ejm. I love this dough toasted though so…. 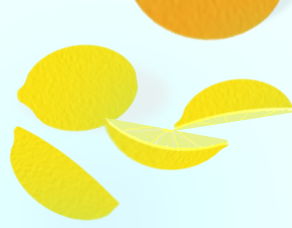 Don’t you just LOVE the citrus peel? So sorry I couldn’t share some of my peels with you I am so very bad, I have visions of making it again. I torn between giving all the remaining orange peel away … so that I don’t eat it all … but I’m reluctant to give it away because I’m eating it … I think that’s probably called a high level problem. I do have 10 more oranges in the basket. The bread’s all gone. Maybe I should bake again. Too bad it didn’t work out. These doughs with so much butter (and also those with lots of eggs) can really laugh at you, happened to me lots of times. You can make a delicious Christmas bread and butter pudding with your too dry stollen. (I did that with my desert dry *cough/choke* panettone once) Happy Christmas! Hmmmm…. Not sure what to say about this whole, er, experience. Sounds like more fun than my computer problems, but only barely. And if the result had been wonderful toast it would have been worth it. Biscotti dipped in hot chocolate (rum-laced, of course) perhaps?